We put the invoice in the packages that are ready to be shipped,and put the slip and wrap the packages. The store name, store number, slip number, and lot on the package will be checked and matched with them on the slips of delivery and invoice. In the photo, putting slips by proxy for a department store. We often ship items that can easily wrinkled hung in a rack. For some customers, we can provide special delivery services.We can divide items by area and load and ship in different trucks. We match numbers of issued slips, hangers and numbers of items going to be shipped and hangers. 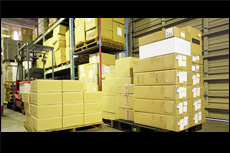 We separate items by shipping companies and keep them on palettes. 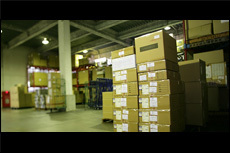 We load items on trucks and complete the work as items reached properly.